Am I feeling better or am I in denial? A question that can only be answered by oneself. I find this question to be very interesting but it is complex in the sense that denial often starts out as feeling better but as it progresses, (especially if it’s strongly negatively focused) can have a detrimental effect on our life. 1. The refusal to grant the truth of a statement, situation or allegation. 2. The refusal to accept or believe something, such as a doctrine or belief. 3. An unconscious defence mechanism characterised by the refusal to acknowledge painful realities, thoughts, and/or feelings. Most would agree with the general description above, but to understand how denial starts, let’s go to the beginning. Many times denial begins from not wanting to accept a reality in our lives, in other words, not wanting to focus strongly and feel negative emotion about something that has manifested or is about to manifest in our life. Because we want to feel good and if we are looking at something and believe we cannot feel good about it, it will often feel better to pretend this “not good feeling thing” is not happening, rather than facing the truth of the situation.This can actually be a good action to take if it’s not a personal circumstance in our lives or a situation that doesn’t really affect us directly. Denial comes from some misunderstandings about ourselves and life, the main one being, “I cannot control how I feel, I am just a responder to whatever comes within my world.” Now nothing could be further from the truth, but if this has been what we’ve become accustomed to doing, it does take some time and effort to change. It’s important to note the difference between trying to move a resistant situation to a better feeling place or denying it’s even happening. When attempting to move our thoughts to feel better, we always acknowledge what has happened and accept whatever feelings have been stirred within us, making an effort to move to a better feeling vibrational place. ( because we’re knowing how important our thoughts and emotions are and that we’re creating our life experience with them!!) Whereas if we are in denial the unwanted situation is completely avoided at all costs so we don’t have to confront how we truly feel about it. 1.Acknowledge something unwanted has happened. 2.Acknowledge we are feeling strong negative emotion about it. 3.Know this is something that’s important for us to move to a better vibrational place about. 4.Know we have the ability to gradually move ourselves to a better vibrational place. And why would we bother to do this? Firstly, isn’t it better to feel better, even if it does take a little bit of effort? For you cannot hide the truth from the Law of Attraction, just because we are in denial does not mean that those emotions aren’t pulsing strongly within us. For something strongly unwanted to turn up in our experience means there is something within us (that we may not be aware of) that the Law of Attraction has responded to, and if we allow ourselves to stay in a strongly negative feeling place,(even though we may have done our best to pretend those emotions weren’t there) more unwanted circumstances that have a similar feeling will turn up until we have dealt with our negative emotion and moved it to a better feeling place. Now, depending on where you are in relation to what you are wanting and how strong the emotions are you are feeling about it, will depend on what action may be the best to take. The more personal the situation or circumstances are for us, and the stronger the emotion we would feel if we allowed ourselves to feel it, the more important it is to face the situation and emotions that are coming up, (even if they are strongly negative) and deal with them. I am not suggesting we feel negative emotion from whatever is turning up and stay there feeling bad, or even worse, to focus our attention negatively and produce stronger negative emotion towards or about it, but I am saying, it’s important to initially feel where you really are even if it doesn’t feel great, and then gradually move through those emotions to a better vibrational place. That’s the only thing to do, denial does not release negative emotion that is already within us, it keeps it there, where it usually grows stronger and therefore has stronger attracting power to it that the Law of Attraction is responding in-kind to. I’m sure deep down, within us all, most of us know this, but I understand it’s hard to hear sometimes. If it’s a circumstance that’s not very personal to us that isn’t producing strong emotion within us, and doesn’t appear to be a situation that is reoccurring over time, it’s a good cause of action to just let it be. In this situation I would say, it’s not really denial but just not wanting to bring unwanted circumstances into our general vibrational mix that aren’t so important to us or affecting our life. Yep, no use giving ourselves more negative things to focus on and feel bad about…unless of course we’ve worked through everything that’s very important to us and moved to an awesome place on every subject, then sure, we can focus our attention on every other problem in the world and try to bring ourselves into a better feeling place regarding them…why not? Hehehe!! 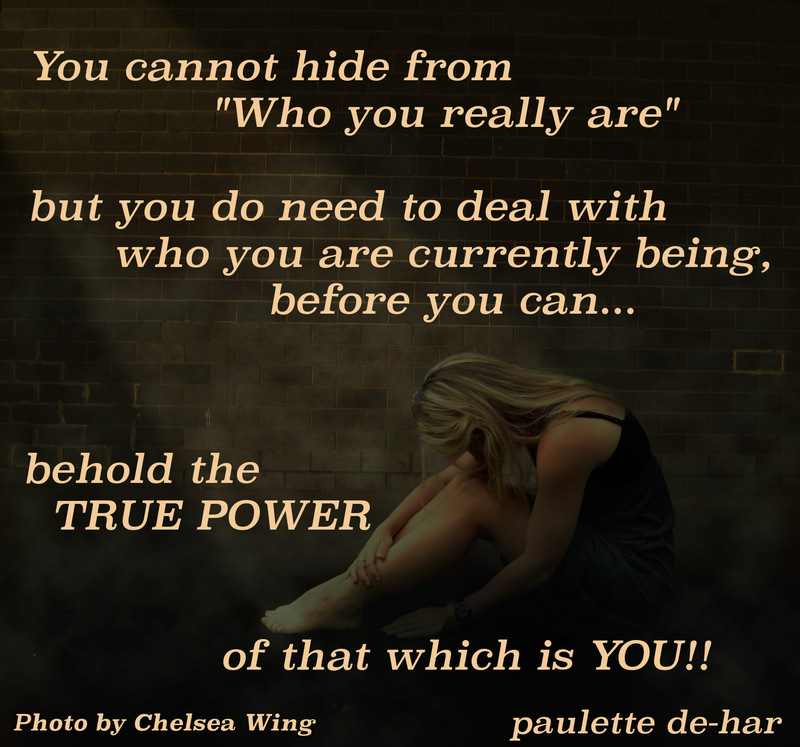 The truth is….You cannot deny what is within you, the truth will be constantly shown to you through the physical manifestations you attract, whether you are aware of it or not…. Previous Article Letting go is not the same as giving up…. Or is it??? Next Article Is it stink….to like your own post?? ?